½ mile from Bell Tower. 20+ easy-moderate miles. Abandoned railroad right-of-ways can make great multi-purpose trails and this one is no exception. 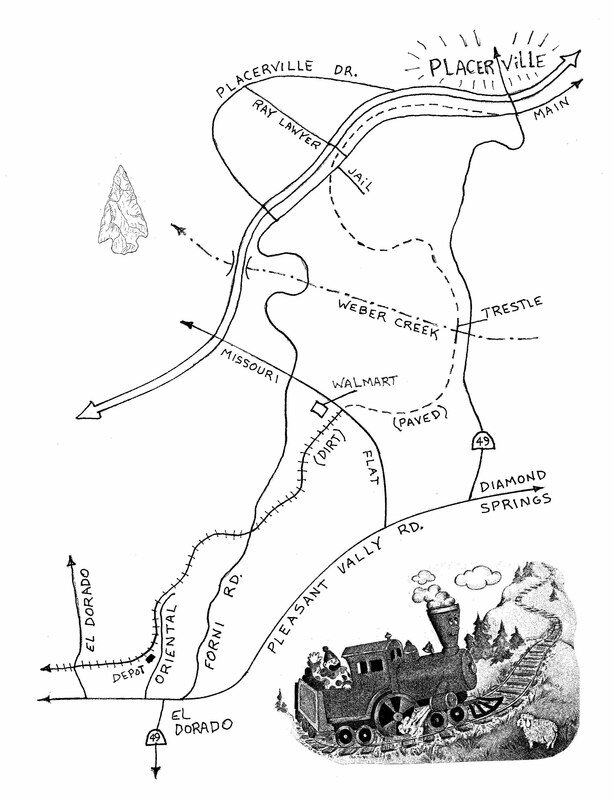 Southern Pacific railroad ran this line from the town of Latrobe, on the western edge of El Dorado County, up to Diamond Springs where it connected with a narrow gauge line to Grizzly Flat and this line to Placerville. The trail west begins from Forni Road just beyond Main Street. This section is currently being paved for 1 mile to Ray Lawyer Drive and a short ways further to the existing paved trail at Forni Road. If you wish to start from the second Forni Road there is parking at the Library on Ray Lawyer across Highway 50. From here the trail continues southwest on the old raised railroad bed which offers good views of the rural countryside as you leave the downtown and residential areas. The city has installed exercising stations along the way for your added work-out if walking, running, or riding doesn’t quite offer enough exercise for you. At about the 3 mile point the trail comes to the awesome 120 foot high Weber Creek railroad trestle. This bridge was bought from SP for the huge sum of one dollar. After being off limits for years it was refurbished with new decking and railings in the Fall of 2009 when it reopened for use. The trail continues with some rolling terrain before reaching Missouri Flat Road, where the paving ends near a small parking lot. To continue you must safely cross the busy Missouri Flat Road and find the continuation of the unpaved railroad line behind Wal-mart. This section is improved dirt all the way to El Dorado; meaning that the shrubbery is pruned and the path somewhat smooth and wider. This section crosses Forni Road one more time before coming into the El Dorado train depot at Oriental Ave. Plans are underway to pave this section from Missouri Flat. Whoopi! This is a good place to mention that train buffs are operating a small train between the El Dorado station and the Shingle Springs station on weekends, from 11am-3pm, a 45 minute ride for the 15 mile round trip. You board at the El Dorado station on the 1st and 3rd weekends, and board at the Shingle Springs station on the 2nd and 4th weekends. For more information call 530-409-8473. For the rest of us we can walk or ride the unimproved dirt trail that follows along to the side of the track towards Shingle Springs. After leaving the quaint town of El Dorado we soon cross El Dorado Road. (Watch for cars at all road crossings because they do not stop). The single track follows along the right side of the tracks. You have to walk the tracks to cross a creek just before the road. The trail continues along the right side all the way to Davidson Road, then it continues along the right until you come to a creek where you ride in the creek (if the water isn’t too deep!) to cross under the tracks to the other side. Once on the left side the trail becomes more challenging, but fun single track that climbs and falls somewhat separated from the rail line. Before long you reach what is known as “tunnel cut,” where the tracks were blasted through a lot of rock, close to Highway 50, near the Red Hawk Casino. A trail also goes right along the tracks through the gorge for a different experience. The trail passes behind horse ranches with rolling oak hills as it makes its way to the Shingle Springs station and the busy town of Shingle Springs. Beyond Shingle Springs you have a choice of single track along either side of the railway for miles, crossing South Shingle Road twice before reaching a left hand section on your way to my favorite vista, Sugarloaf Mountain. Here the railway goes two thirds the way around the “hill” with great views to the south and the Cosumnes River Valley off in the distance. After more ups and downs along the sides you reach the small berg of Latrobe. Riders can continue to follow the railroad all the way to Folsom and connect to many miles more of paved bike trails. History: This rail line is reported to be the first railroad built in the California. Originally known as Placerville and Sacramento Valley Railroad, it reached present day Latrobe in 1864. This town was at the crossroads of the Amador County—Folsom Road. and is named after the civil engineer who designed the railroad. The railroad later became part of the Southern Pacific railroad and at one time was expected to extend all the way to Lake Tahoe. It never made it beyond the town of Camino. (See El Dorado Trail East for much more).